Scott James, Lockheed Martin manager of production engineering, front row from left, Charley Jackson, Lockheed Martin HR business partner, give a $20,000 check to SAU President Dr. Trey Berry for SAU Engineering with representatives from SAU’s growing program looking at in front of the Science Center. 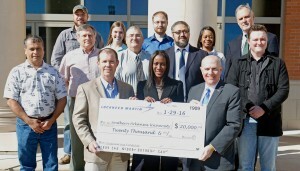 Scott James, Lockheed Martin manager of production engineering, front row from left, Charley Jackson, Lockheed Martin HR business partner, give a $20,000 check to SAU President Dr. Trey Berry for SAU Engineering with representatives from SAU’s growing program looking at in front of the Science Center.Southern Arkansas University Engineering was recently granted $20,000 from Lockheed Martin, a contribution that brings the total amount raised to SAU Engineering to more than $350,000. Lockheed Martin’s investment will support the purchase of equipment and technology to ensure SAU students have the resources available to be prepared for today’s work environment. Lockheed Martin is also committed to other training opportunities for SAU students, including internships. SAU Engineering, which launched fall 2013, already reached an enrollment of 172 students in fall 2015. It is the only engineering program in all of south Arkansas, and since its inception has had strong industry support. It has helped SAU become the fastest growing university in Arkansas, along with SAU’s affordability and culture of caring. SAU is the most affordable university in Arkansas and has the highest return on investment, according to the U.S. Department of Education. Headquartered in Bethesda, Maryland, Lockheed Martin is a global security and aerospace company that – with the addition of Sikorsky – employs approximately 126,000 people worldwide and is principally engaged in the research, design, development, manufacture, integration and sustainment of advanced technology systems, products and services. Lockheed Martin’s Camden Operations facility assembles missiles and ground vehicles for the corporation’s Missiles and Fire Control business area.